Computers these days come in all shapes and sizes, and cover a broad range of specs, capacity, and function. One thing that every desktop and laptop computer system has in common, however, is a lack of quality speakers. Built-in computer speakers are invariably terrible, failing to realistically emulate even the sounds of someone speaking at normal volume; the distortion is clearly audible, even to the inexperienced ear. Some computer systems come with a standalone pair of desktop speakers, but even the most expensive systems rarely provide high-quality speakers in this capacity. Meanwhile, all but the most affordable, stripped down, bare bones systems come with sound drivers capable of taking advantage of so much more in terms of speaker hardware. Whether you’re a PC gamer, a music lover, a Netflix aficionado, a YouTuber, or even if you just like to have an audiobook to listen to while going about your daily routine, you owe it to yourself to improve the quality of your listening experience. 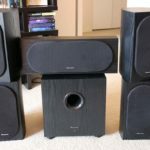 A good set of desktop computer speakers will add depth, immersion and overall quality to all of the above, and then some. Whether it’s the highest quality sound you’re looking for, or just the ability to occasionally crank the volume and share with your neighbors, there are speakers out there that will blow the lid right off your expectations — but how do you choose? There are a lot of options out there, and many variables to consider. Speakers are a surprisingly complicated bit of hardware. 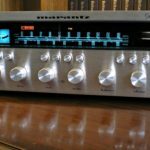 In order to help you out, we’ve put together a brief list of some of the best computer speakers available on today’s market. We’ve put in the legwork, so all you need to do is decide what type of experience you’re after, then find the item on the following list that corresponds most closely to what you’re looking for. If there’s something you’re not certain about, or you think we’ve left something important out of our list, don’t hesitate to drop us a line and let us know! We’ll do our best to respond to all inquiries quickly and concisely. For many people in today’s economy, money remains a major concern. Not all of us can afford to go all-out on a set of computer speakers, as much as we might like to. Fortunately, there are a lot of affordable speaker options, which are designed to deliver realistic sound quality across as broad a range as possible—for as little money as can be reasonably expected. We had a hard time picking one item for this category, so we selected our two top favorites. If you’re a music lover, musician, or YouTube star—someone who relies extensively on sound quality for your PC’s primary role in your life—you may want to shift your priorities towards a less affordable, but higher-quality speaker, if possible. Regardless, the following items would make excellent backup options, and should be otherwise adequate, even in such sound-intensive roles. Cyber Acoustics offers a set of 30-watt desktop computer speakers which is definitely one of highest quality affordable options available today. For your average PC gaming or film enthusiast, these speakers promise many hours of enjoyment of all of your favorite series and franchises, thanks in part to the included 5-and-¼-inch subwoofer. The speakers also come with satellite drivers, which help to create a surprisingly rich and immersive musical environment; if you find yourself needing to enjoy a wide-ranging collection of music tracks while stuck on a budget, this might be the first of our two options that you’ll want to look at. The speakers include a 5-foot power cable, as well as 11 feet of speaker cable for the satellites, and are housed in a quality wood cabinet designed to avoid excess reverberation. Master and bass volume adjust separately. The speakers also include a headphone jack and auxiliary line-in. We like Cyber Acoustics a lot—don’t get us wrong—but we love JBL Pebbles for its balance of affordability and overall speaker quality. For less than $100, they deliver high-quality sound at a bargain, and they look good doing it. The Pebbles plug directly into your computer via your USB, and they also have an aux line-in for other gadgets. The volume control knob on the speakers themselves will sync with your computer’s volume control. The JBL Pebbles are an excellent all-around choice for computer users who care about sound, but who need that bargain price, and whose sense of immersion isn’t based entirely on audio quality. They definitely lack some of the depth and definition of larger, more expensive models, but will satisfy the needs of the significant majority of gamers, audiobook fans, and other audiophiles. Gamers, in particular, might get a kick out of the Pebbles appearance—like something out of their favorite sci-fi franchise. There are lots of good reasons to want Bluetooth connectivity, which has become a virtual expectation in the 21st century. Bluetooth is reliable, user-friendly, easy to manage, and affordable. It allows for integrated software apps to manage your settings for multiple devices, and further increases each device’s functionality: with bluetooth, your desktop speakers can function as standalone speakers for other devices, such as your smartphone, smart TV, or stereo system. Regardless of the reason why you want Bluetooth compatibility, the Polk Audio Hampden AM6510-A is the best option available on the market that we could find. Beyond the sleek, retro style of the faux-wood cabinet, which offers a smoothly polished appearance, the speakers have an impressive response time of up to 22,000 Hz. In addition to the Bluetooth compatibility itself, which allows for smooth streaming from any other mobile Bluetooth device in your immediate vicinity, Polk’s speakers also have a USB port for playback from desktop devices which lack Bluetooth. These speakers definitely aren’t the most affordable on the market, but their response time and overall range makes for a remarkable sound quality, even for high-end desktop computer speakers. These are an excellent option for musicians and YouTube stars who require a high-end sound system to be able to produce, as well as those who find themselves enjoying greater depth in their audio experience. The Harman Kardon Soundsticks III look like something designed by an engineer from the Jetsons, though someone in the office did suggest “Minority Report.” The point is valid: there is a futuristic, yet simultaneously minimalist approach to the design used by Harman Kardon for their latest offering, which is likely to turn heads each time a new person lays eyes on them for the first time. They fit in well with modern minimalist themes too: sleek, smooth, rounded, and absent any sharp angles. The speakers are at once artistic, and highly functional examples of modern acoustic design. The Soundsticks III have excellent sound quality as well. A 10-watt amplifier feeds power to several full-range transducers, with a separate 20-watt amp powering bass that will make the modern art on your walls shake when you turn up the volume. 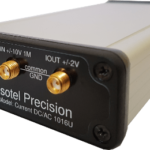 Stereo connectivity allows for a hookup to nearly any device. The Soundsticks are designed to take advantage of the many adjustments available to PC sound cards today, and are extremely receptive to preferential user settings, delivering one of the best overall ranges of sound quality of any of the speakers on our list. The KEF X300A are relatively simple and unremarkable in appearance, looking like a typical pair of music speakers (although the tweeters do somewhat resemble a pair of fancy rims). Looks can be deceiving, however, as this straightforward, even minimalis design provides for highly advanced sound quality right out of the box. This simple, two-speaker system covers an extremely broad range of sound, despite lacking a subwoofer, and offers far and away the best overall sound quality of all of the speakers we’ve tried. The deviation from flat sound is at an absolute bare minimum across the full range of human hearing, faithfully replicating realistic vocals, music, film sounds, video game action, and more. The lack of a subwoofer is in no way a detriment to the KEF’s amazing quality sound. This is because either speaker unit includes separate, nested cones, handling the separate audio capacity of tweeters and subwoofers with no discernible breakdown in quality. The most unusual feature, requiring some adjustment in terms of the average PC user, is the fact that either speaker requires its own dedicated power cord. We’ve gone into affordable speakers already; this is a little bit different. This focuses on the best overall value. Financially, the Logitech Z623 represents a slightly more substantial investment than either of our top picks for sheer affordability, but what you receive in return is absolutely substantial. Should you happen to have multiple sets of speakers available for comparison, you will immediately be able to tell the difference. 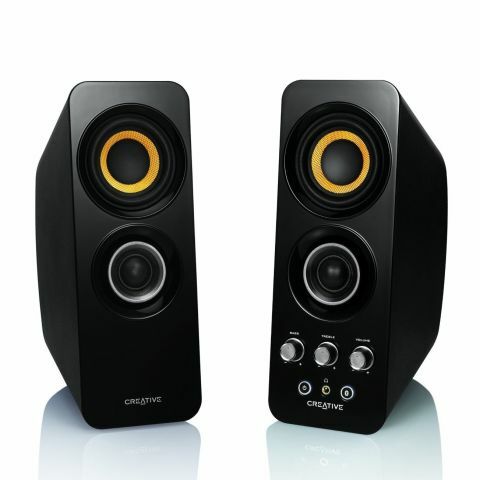 From Logitech, one of the most recognizable names for affordable, quality computer accessories today, it should come as little surprise that the Z623 speakers are one of the most frequently purchased desktop speaker models on the market. While not the most affordable speakers around, they are surprisingly inexpensive for what they offer: a sleek, attractive design, with a powerful subwoofer; their THX certification makes them one of the best speakers around for that pristine, theater-quality home movie experience. 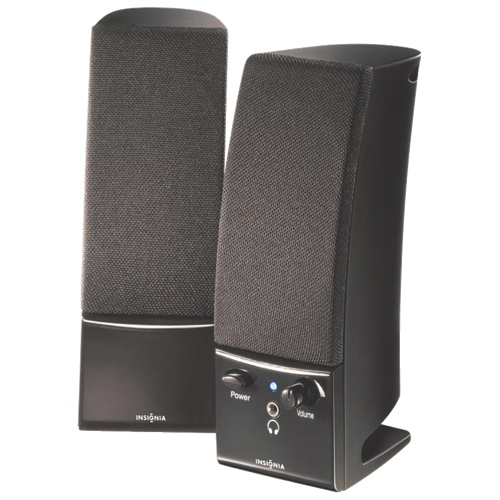 By default, the Logitech Z623 speakers are not Bluetooth compatible, but that level of connectivity can be provided for a small additional fee. You can connect up to three audio devices at once, without Bluetooth, thanks to the Z623’s RCA and 3.5mm inputs. The 200-watt system powers a deep, powerful bass driver that delivers room-filling performance. Overall, the speakers don’t offer studio-quality sound, but they do provide one of the most affordable mid- to high-end performance experiences for any gamer or movie lover. Most music fans should be pleased as well. We thought it would be appropriate to present a category of speaker where a wide range of factors could be taken into consideration in terms of overall quality. Here, as with the best affordable options, we were unable to come up with a single clear winner, so we’ve got two options available for you to choose from. Both options feature an excellent mix of stylish appearance, affordability, sound quality, function, and connectivity, and should be suitable for a wide range of desktop and laptop computer applications. We paid particular attention to how well each speaker works with typical PC sound system levels and enhancements. These two models performed particularly well in accommodating loudness equalization, pitch shifting, voice cancellation, and so on. The Edifier USA e25 Luna Eclipse 2.0 were an easy inclusion in our top overall desktop computer speaker systems. They weren’t the clear lead, but we didn’t feel happy with the idea of leaving them off the list entirely, and right away it’s easy to see why. The Luna Eclipse 2.0 desktop PC speakers offer some of the best quality sound available, coupled with a smooth and attractive modern design, a wealth of built-in features, advanced connectivity, and a price tag which is—thankfully—a lot smaller than the sum of all of its parts might lead one to believe. Starting with style, we have a sleek, modern look, with elegantly curved surfaces that fit a variety of modern aesthetics. They don’t take up a lot of space, although they aren’t completely wireless: they need to be plugged into a power brick. However, the speakers can then connect to your PC (or other devices) via Bluetooth, allowing for flexible positioning anywhere in the immediate vicinity. The Luna Eclipse 2.0 come packed with a lot of built-in hardware. That’s a pair of 15-watt tweeters and 22-watt mid-range drivers. That all fits into a size of speaker that fits neatly in with most desktop computer setups, and is comparably sized to much less powerful PC speaker models, which don’t cost substantially less than Edifier’s speakers. Other speakers also tend to lack Edifier’s digital enhancements, such as built-in digital processing and room correction. Here it is, then: our pick for the best desktop speakers on today’s market. With almost as much saturation in the PC speakers market as there is in the PC market itself, it’s easy to understand why we had trouble picking just one item for overall speaker quality. That being said, if we had to pick just one, the Audioengine A5+ 2-Way speaker system would have been it. Eclipse’s Luna model is superb, but (while it is definitely more affordable, thus an easy shoe-in for runner up) it falls short of the Audioengine’s near-perfection in terms of features and engineering. 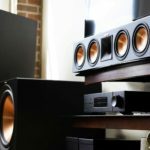 Simply put, theAudioengine A5+ 2-Way speakers will definitively satisfy the widest range of audiophiles that any one set of computer speakers could possibly satisfy. Their frequency response is exquisitely balanced, and the accuracy is almost perfect. There is virtually no distortion audible, even at extreme ends of the audible spectrum. Some buyers have even reported comparing these speakers from Audioengine to other, studio-quality devices costing hundreds, or even thousands of dollars more for a complete system. The deep, rich bass made available by Audioengine’s top-of-the-line digital engineering is warm and immersive, but not overwhelming. Its rich and filling sound has amazing depth and clarity, without being too much to handle. Likewise, the mid-range is smooth and even, and the treble is crystal-clear, without being piercing or painful. Everything is smoothly blended with an overall sound quality that never seems to break down or come apart. As desired, you can bypass analog output for a clearer, more pure signal with the speakers’ included digital converter. The speakers’ built-in amplifiers offer a whopping 50 watts per channel, negating the need for a stereo receiver and making the actual setup of the speakers a breeze: they’re virtually plug-and-play, with little need for out-of-the-box adjustment. If adjustment is necessary, there is a handy remote control, making it quick, convenient and painless. The speakers connect via headphone jack or USB, and offer RCA inputs for other devices, as well as a USB power port for mobile device charging. If you ever had the chance to spend time in a well-equipped music studio, you’ve probably noticed how different and better everything sounds. You don’t have to be a music producer or a professional musician to appreciate rich, quality sound and to be aware that your PC built-in speakers just don’t quite meet the mark when it comes to quality sound. While your built-in PC speakers can be decent enough when it comes to listening to a youtube interview or watching a funny cat video, if you really want to experience true music (and proper sound overall), you’ll need to get yourself some high quality speakers. If the last time you bought PC speakers was a good 5 or 10 years ago, you might remember them as being bulky and cumbersome. Luckily, there are so many excellent choices on the market to choose from today. If you’re still not quite convinced about investing in additional pieces of equipment, keep reading for the 10 main reasons on why you should get quality speakers for your PC. The main reason, and probably one that goes without saying – music sounds as good as the system it’s playing through. Chances are, the built-in speakers that come with your computer are not really that good, especially if you’re using a laptop. Even if you don’t have a big budget to spend on speakers, there are low-cost speakers that will noticeably improve your listening experience. With the fast advancement of technology, speakers today are much easier to use than those you had even 5 years ago. This means that most speakers today require either very easy installation or no installation at all. This means you get to enjoy your new piece of equipment immediately after taking it out of the box, without spending hours figuring out how to install them. 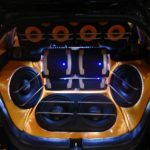 Depending on the way you plan to use your speakers and what to use them for, there are many different types of speakers on the market today to fit your exact needs. For instance, the most commonly used type is the 2.0 one, which is a two-speaker system with no subwoofer. The next most common one in line is the 2.1 system that basically requires two satellite speakers and one subwoofer. With so many different types available, you can choose the right one depending on what you plan to use your speakers for. Do you plan to listen to music on them, watch movies or maybe use them for playing computer games? Different PC speakers connect to your PC in different ways. In terms of connectivity, you can choose from the traditional wired speakers or wireless speakers that connect to your computer over Bluetooth. So depending on your needs and lifestyle, if you’re looking for portability and adaptability, wireless speakers are specifically designed for that. They can easily be placed around a room and taken with you wherever you go, plus they can be used with multiple devices. Aside from portability and adaptability, one other thing the highly popular wireless PC speakers are good with is that they save you from all the unwanted clutter. Because, who needs even more cables around the house? So if you won’t (or even can’t) add any more wires around your computer, getting wireless speakers for your computer is a really elegant solution. The most-basic speakers still come with no controls of their own, which means you adjust the output volume from your computer. Even though you might not need anything more than this, it’s good to know that there are lots of speakers that provide their own controls. This means that you can adjust their volume, bass and treble levels to fit your particular listening taste. Most wired computer speakers these days are connected to your computer through a single USB cable. This means that you won’t have to worry if the system you’re getting is compatible with your computer. Loudspeaker products nowadays are compatible with any speed USB port too. Since digital stereo audio has pretty low bandwidth demand on the Universal Serial Bus, the usb-speakers you will get will be compatible with older computers, as well as newer ones. PC speakers these days, especially those that are made to be transported on a daily basis, are extremely well made and super sturdy. The sturdiest option would be wireless speakers (usually connected to your device via Bluetooth), since they’ve been designed to be used in an environment where everyday speakers can get easily damaged. These speakers won’t give you any problems if they’re brought to the beach, covered with dust or even sprayed with water (for certain models). Of course, just like with any other equipment, you basically get what you pay for. Fortunately though, with the advancement of technology and with so many models and brands flooding the market, there are many great options to fit everyone’s budget. So first of all, if you do your research and read customer reviews online, you can always find a decent one for your budget. Secondly, speakers are actually among the computer accessories that get discounted the most. So if you look around carefully, you can always find a good bargain. You might think that adding additional pieces of equipment will result in more power used. Well, most PC speakers today are specially designed to save energy while providing maximum performance. If you’re looking to save some energy, then you might be most satisfied with a wireless speaker, since those are made to run for hours before they need to be recharged (or have their batteries changed). The ready availability of information online has led to a dramatic escalation in the informed nature of today’s consumer. When a person is interested in something, they tend to investigate it thoroughly, and can learn as much in fairly short order as would have been attributed to general experts in the field a mere fifteen to twenty years ago. 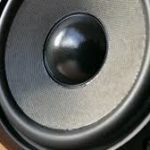 Regarding the properties of headphones and speakers, including (specifically) desktop computer speakers, eTutorials.org has some useful information about essential speaker properties, which you might find interesting. If you are interested in any other type of speaker you will find out homepage here. If you find you are having difficulty setting up your new computer speakers check out the video below.